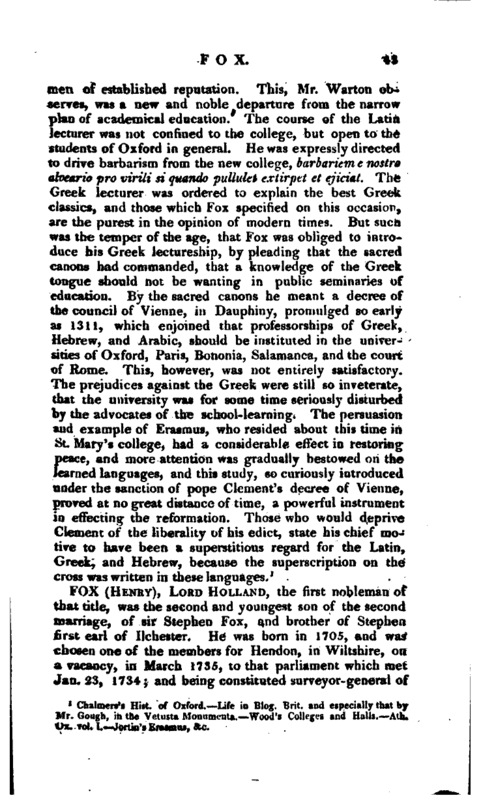 According: to Wood, who availed himself of some ms accounts of Fox preserved in this college, written by i’roidentftreenway, “the Founder was born in an ancient house known to some by the name of Pullock’s Manor.” “This house,” he adds, “was well known for many years to the fellows of Corpus, who reverently visited it when they went to keep courts at their manors.” To what was before recorded of Fox, Mr. William Fulman, a scholar of Corpus, and an able antiquary, made many additions, with a view to publication, which he did not live to complete. His Mss. are partly in the library of this college, and partly in the Ashmolean Museum. Mr. GougU drew up a very accurate sketch of Fox’s Life, for the Vetusta Monumcnta. The succession of the House of Stuart, as well as that of Brunswick to the British throne, is to be referred to this alliance, and to the prudence of bishop Fox in the negociation of it, See Lord Bacon’s Hist, of Henry VII. In 1500, the university of Cambridge elected him their chancellor, which he retained till 1502; and in the same year (1500) he was promoted to the see of Winchester. In 1507 he was chosen master of Pembroke-hall, Cambridge, which he retained until 1519. In 1507 and 1508 he was employed at Calais, with other commissioners, in negociating a treaty of marriage between Mary, the king’s third daughter, and Charles, archduke of Austria, afterwards the celebrated Charles V. In 1509-10, he was sent to France with the earl of Surrey, and Ruthal, bishop of Durham, and concluded a new treaty of alliance with Lewis XII. In 1512 he was one of the witnesses to the foundation charter of the hospital in the Savoy. In 1513 he attended the king (Henry VIII.) in his expedition to France, and was present at the taking of Teroiiane, and in October following, jointly with Thomas Grey, marquis of Dorset, he concluded a treaty with the emperor Maximilian against France. In 1514, he was one of the witnesses to the renunciation of the marriage with prince Charles of Spain by the princess Mary; one of the commissioners for the treaty of peace between Henry VIII. and Lewis XII. of France; and for the marriage between the said king of France and the princess Mary, the same year. 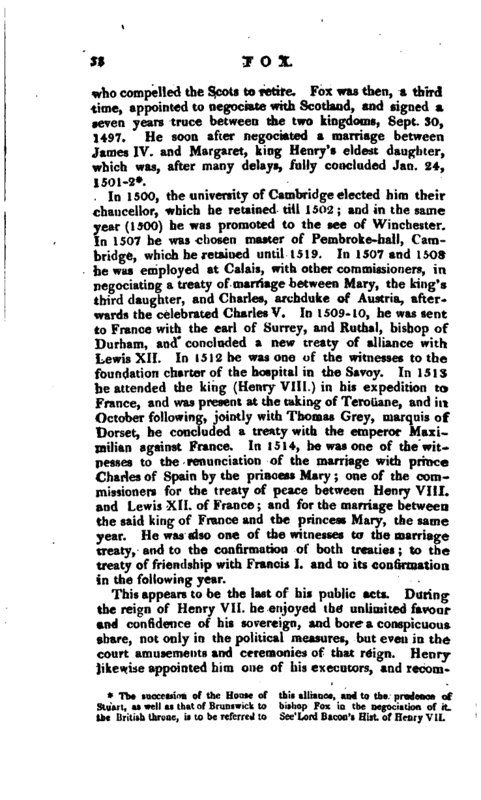 He was also one of the witnesses to the marriage treaty, and to the confirmation of both treaties; to the treaty of friendship with Francis I. and to its continuation in the following year. This appears to be the last of his public acts. During the reign of Henry VII. he enjoyed the unlimited favour and confidence of his sovereign, and bore a conspicuous share, not only in the political measures, but even in the court amusements and ceremonies of that reign. Henry likewise appointed him one of his executors, and | recommended him strongly to his son and successor*. But although he‘ retained his seat in the privy-council, and continued to hold the privy- seal, his influence in the new reign’ gradually abated. Howard, earl of Surrey and lord treasurer, had been his rival in Henry the Seventh’s time, and learned now to accommodate himself to the extravagant passions of his new master, with whom he was for a considerable time a confidential favourite; and the celebrated Wolsey, who had been introduced to the king by Fox, in order to counteract the influence of Surrey, soon became more powerful than either. After remaining some time in office, under many mortifications, our prelate, together with archbishop Warham, retired from court in 1515. 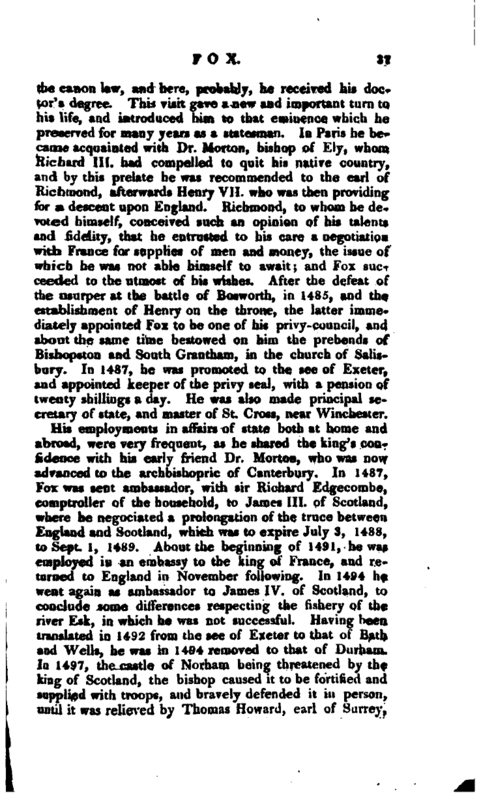 Such was the political life of bishop Fox, distinguished by high influence and talent, but embittered at length, by the common intrigues and vicissitudes to which statesmen are subject. Inui can be adduced, than that he was baptised the young prince, chtifcu to be sponsor to the young | buttresses that, stretching over the said ailes, support the upper walls; the rich open battlement which surmounts these walls; and the elegant sweep that contracts them to the size of the great eastern window: the two gorgeous canopies which crown the extreme turrets, and the profusion of elegant carved work that covers the whole east front, tapering up to a point, where we view the breathing statue of the pious founder resting upon his chosen emblem, the Pelican. 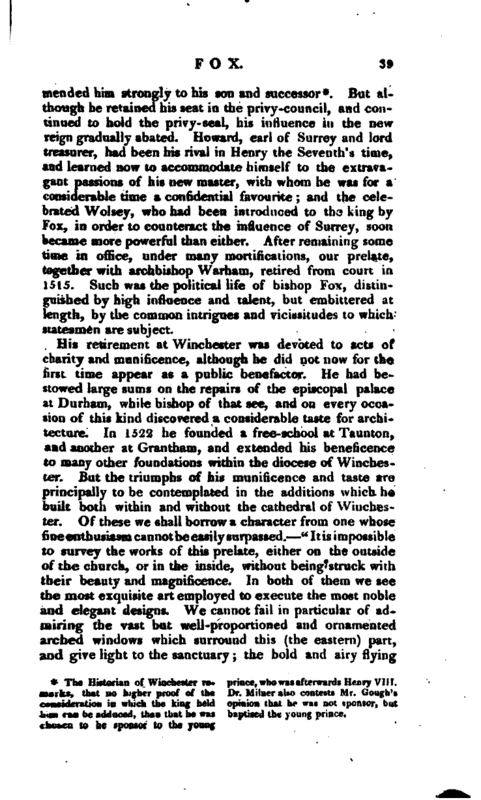 In a word, neglected and mutilated as this work has been during the course of nearly three centuries, it still warrants us to assert, that if the whole cathedral had been finished in the style of this portion of it, the whole island, and perhaps all Europe, could not have exhibited a gothic structure equal to it*." buried behind the high altar, or in dif- numenta, vol. II. plate L. | cising hospitality, and promoting the trade of the city, by a large establishment which he kept up at Wolvesey, of two hundred and twenty servants. 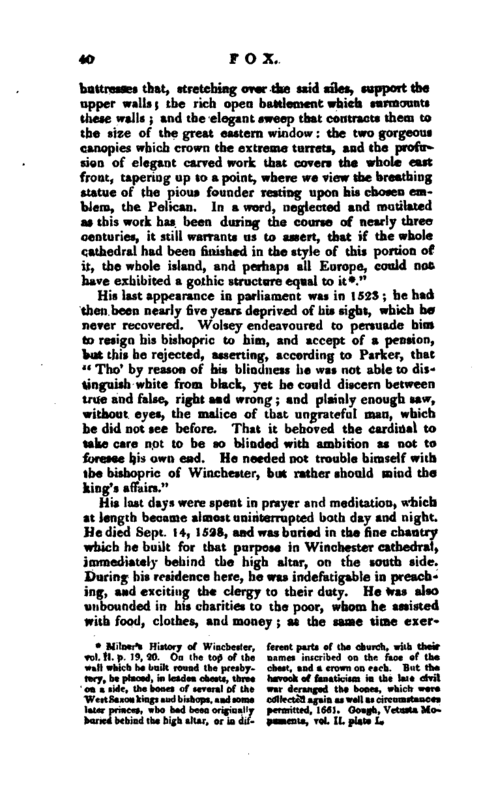 “His character,” says Mr. Gough, “may be briefly summed up in these two particulars: great talents and abilities for business, which recommended him to one of the wisest princes of the age; and not less charity and munificence, of which he has left lasting monuments.” Of his writings, we have only an English translation of the “Rule ofSt. Benedict,” for the use of his diocese, printed by Pinson, 1516, and a Letter to cardinal Wolsey, the subject of which is the cardinal’s intended visitation and reformation of the clergy. Fox expresses his great satisfaction at any measures which might produce so desirable an effect. The general and respectful style of this letter either affords a proof of Fox’s meek and conciliatory temper, or suggests a doubt whether our historians have not too implicitly followed each other in asserting that Wolsey’s ingratitude was the principal cause of his retiring from court. 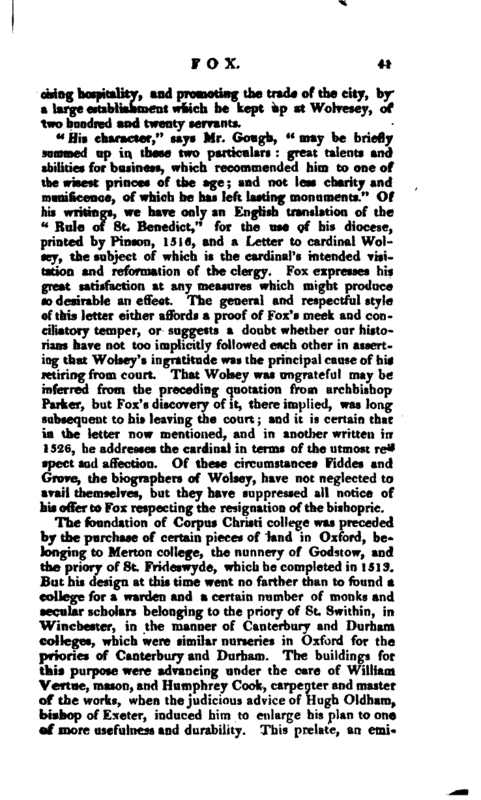 That Wolsey was ungrateful may be inferred from the preceding quotation from archbishop Parker, but Fox’s discovery of it, there implied, was long subsequent to his leaving the court;and it is certain that in the letter now mentioned, and in another written in 1526, he addresses the cardinal in terms of the utmost respect and affection. Of these circumstances Fiddes and Grove, the biographers of Wolsey, have not neglected to avail themselves, but they have suppressed all notice of his offer to Fox respecting the resignation of the bishopric. The foundation of Corpus Christi college was preceded by the purchase of certain pieces of land in Oxford, belonging to Merton college, the nunnery of Godstow, and the priory of St. Fridesvvyde, which he completed in 1513, But his design at this time went no farther than to found a college for a warden and a certain number of monks and secular scholars belonging to the priory of St. Svvithin, in Winchester, in the manner of Canterbury and Durham colleges, which were similar nurseries in Oxford for the priories of Canterbury and Durham. The buildings for this purpose were advancing under the care of William Vertue, mason, and Humphrey Cook, carpenter and master of the works, when the judicious advice of Hugh Oldham, bishop of Exeter, induced him to enlarge his plan to one pf more usefulness and durability. This prelate, an emir | nent patron of literature, and a man of acute discernment, is said to have addressed him thus: “What! my lord, shall we build houses, and provide livelihoods fo/ a company of monks, whose end and fall we ourselves may live to see? No, no, it is more meet a great deal, that we should have care to provi.de for the increase of learning, and for such as who by their learning shall do good to the church and commonwealth.” These arguments, strengthened probably by others of a similar tendency, induced Fox to imitate those founders who had already contributed so largely to the fame of the university of Oxford. Accordingly, by licence of Henry VIII. 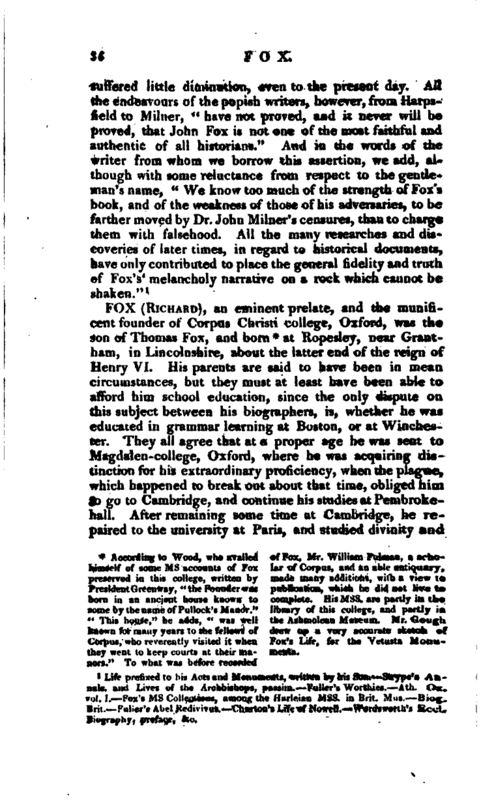 dated Nov. 26, 1516, he obtained leave to found a college for the sciences of divinity, philosophy, and arts, for a president and thirty scholars, graduate and not graduate, more or less according to the revenues of the society, on a certain ground between Mefton college on the east, a lane Dear Canterbury college (afterwards part of Christ-church), and a garden of the priory of St. Frideswyde on the west, a street or lane of Oriel college on the north, and the town wall on the south, and this new college to be endowed with 3 50l. yearly. The charter, dated Cal. Mar. 151 G, recites that the founder, to the praise and honour of God Almighty, the most holy body of Christ, and the blessed Virgin Mary, as also of the apostles Peter, Paul, and Andrew, and of St. Cuthbert and St. Swithin, and St. Birin, patrons of the churches of Exeter, Bath and Wells, Durham, and Winchester, (the four sees which he successively rilled) doth found and appoint this college always to be called Corpus Christi College. The statutes are dated Feb. 13, 1527, in the 27th year of his translation to Winchester, and according to them, the society was to consist of a president, twenty fellows, twenty scholars, two chaplains, two clerks, and two choristers. 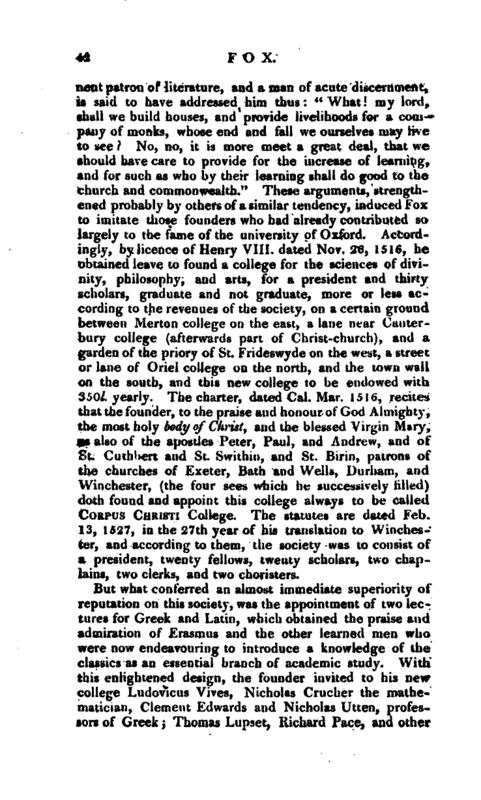 1 Chalmers’s Hist, of Oxford. Life in Biog. Brit, and especially that by Mr. Gough, in the Vetusta Monumenta, Wood’s Colleges and Halls, Atb, Ojf:. vol. 1. Jortin’s Erasmus, &c.